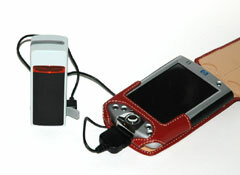 One of the things that makes PDAs and mobile phones difficult to use is the data entry mechanisms. With a PDA you generally get an on-screen keyboard that is touch sensitive, not too bad, but with a Mobile phone you have a keypad with 9 keys to input your entire text. Maybe this is showing my age, but I don't have "idle thumbs" and cannot make my fingers fly round a keyboard. 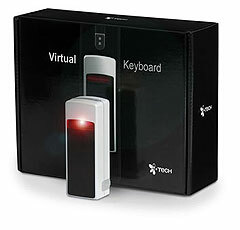 This is where the iTech Virtual Keyboard comes in providing a fully featured keyboard for a number of portable devices. Robert and I first saw this at the Stuff Live exhibition and now I have got my hands on one to review. 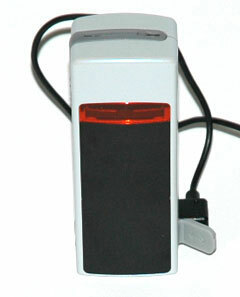 The iTech Virtual Keyboard brings a fresh breath into the input of data into a PDA, mobile phone, and to a lesser extent a laptop computer. 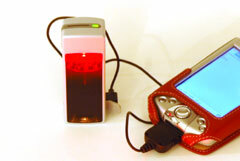 This small device projects a keyboard onto the desk top and detects when you "press a key". The key data is then fed into the computer as if it had been entered in the normal manner. This obviously brings multiple benefits when you have a significant amount of text to enter. It also provides a full sized keyboard (295mm or 11.5 inches) the same as your computer keyboard. The model I reviewed had a 405mm (16 inch) cable connecting the keyboard projector to the PDA. The iTech Virtual Keyboard turned up the day before I flew off to Las Vegas on business (I have a tough life). I thought this would be an ideal time to test the keyboard under a number of different scenarios which maybe wouldn't normally be experienced. I decided to use the virtual keyboard with my iPAQ 2210 mainly because that was what had most of the software I needed in Vegas already installed. All I needed to do was install a driver, which was a very simple process connect up and off you go. The installation CD takes you through the setup in a step by step manner with questions regarding your hardware delivering you to the correct installation options for your device. Once installed you will have a new application VKB on your PDA. This is used to configure the keyboards functions and provides the interface between the keyboard and the operating system. I found that wherever I used the virtual keyboard I always drew a crowd. At first I thought it was my charm, wit and personality, those delusions were shattered when I packed the keyboard away and the crowd dispersed. After that reality check I went back to writing my reviews. The keyboard itself projects to about the size of a normal keyboard. I found the layout a little strange mainly due to the American style keyset. Pressing a key gives a small feedback key click sound, though in reality the clicks did not always coincide with the input of data. 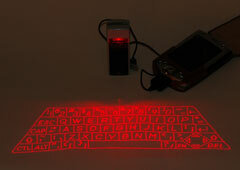 The keys can be activated by hovering a fraction above the projected keyboard, though it is a challenge to strike a key without touching the surface of the table. The projector has a built in motion detector. This disables the keyboard if it detects too much movement. I found that this prevented me from using the keyboard whilst traveling on a train, or plane as there was too much movement to keep the projector activated. This was also a problem trying to use the keyboard on top of my briefcase whilst in the departure lounge. The ideal location for this is on a table top where the surface is not too reflective and you have a reasonable amount of space. I found that it would have been useful to have a stand for the PDA/phone as this had to be left lying on the desk making it somewhat difficult to read. The sensitivity of the projector kept on switching the keyboard off. This was inconvenient at best and embarrassing at worst. There is nothing worse than having an admiring crowd surrounding you and the equipment fails. OK so there are a few but that not the point. When using the projector connected to the PDA I found that the unit was susceptible to twisting when moving the PDA. This resulted in the motion detector shutting the unit down. This was despite the cable being of reasonable length. There is a bluetooth version of the keyboard which will solve both this and the next issue. There appears to be a memory leak in the keyboard driver. If you are using the keyboard for short periods and switching it on and off there doesn't seem to be an issue. If, however, you leave the keyboard driver switched on (without the keyboard attached) overnight all your memory will be used up in the morning. For the 2210 that I was testing with I needed a stand of some sort. I found that I had to have the PDA flat which effectively meant that it was difficult to read what I was writing. Of course as the keyboard uses the serial port I was not able to use the PDA in the cradle either. If you want a reliable bit of business equipment that you can use anywhere then you should look elsewhere for other keyboard devices.